And now for the blueberries. Blueberry Merlot anyway. On this fine late Thursday night, early Friday morning, it’s time to break out the next in the herbal sampler from Tea Forte. Hopefully it’ll do just as well if not better than Apricot Amaretto. The blueberry scent is the first out of the packet. Sweet, sweet blueberries that make you want to eat blueberry muffins, or blueberry pie, or blueberry pancakes. Right now. But I don’t have blueberries right now, or muffins or pie or pancakes. The blueberry quickly gives way to the other flavors though. It’s kind of… herby smelling. Sage maybe. And a little tangy hibiscus. Not quite as exciting, and I still want pancakes. Time to brew. Looks a bit like wine. In fact, it looks like it’s already staining my teapot. Time to not wear a white shirt. Doesn’t really smell like blueberries anymore. Well, it kind of does, but more of artificial blueberries. Like cheap blueberry syrup – heated up. The kind you really like as a kid until you’ve had syrup made from real blueberries. First sip and it starts to taste like it smells, like blueberry syrup. And then the hibiscus comes in. ZING. Tart. Not an awful tart though. It’s like blueberry syrup lemonade, with lemon zing but not lemon flavor. Seems like it could be really nice iced. Not tasting any merlot. That’s not necessarily a bad thing though, except for the merlot name. It could be a blueberry cosmo. 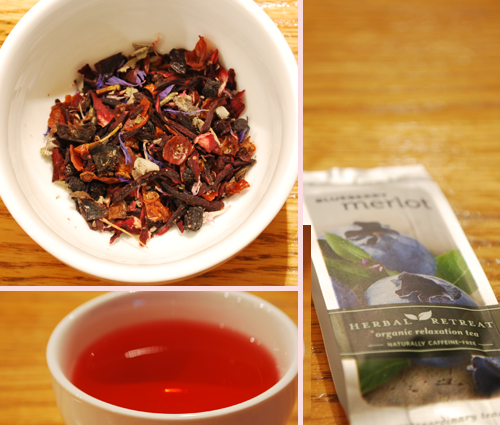 Tea Score: 75 – Really pretty tasty. Cupboard Score: 70 – I could see this being a tasty iced tea. If it really is tasty iced, I’d buy it.